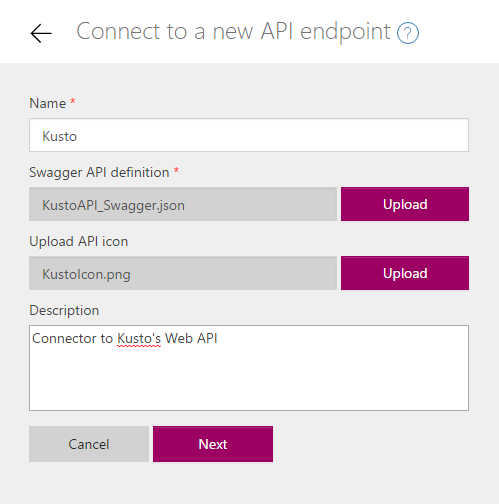 Today, I wanted to share the experience I went through while integrating the Web API for Microsoft’s Application analytics platform as a CustomAPI into PowerApps and Flow, and briefly walk through how to upload a Custom API to PowerApps. Custom API’s are simply any RESTful API that you can integrate with our service. A Well-Documented Swagger/Specification that conforms to the OpenAPI standard. For those who are not familiar with what a Swagger is, it’s a very well documented Specification that defines the structure for how a service can be discovered and its capabilities understood. More information, a Web Editor, and examples of Swaggers from companies like Spotify, Uber, Slack, and Rackspace can be found at Swagger.io. The main things to note regarding integration with Microsoft Flow: The Swagger can be written in JSON or YAML, but Microsoft Flow and PowerApps requires a JSON file. Conveniently, the Swagger Web Editor allows you to download a Swagger as YAML or JSON. Personally, it was much easier for me to use YAML and download it as JSON. A section labeled securityDefinitions needs to be included in the Swagger. Some modifications using Microsoft specific Swagger extensions may be necessary to fully integrate a Custom API with Flow. Application analytics is a relatively new service that Microsoft publicized, although it’s been used for a while internally at Microsoft. It is a “Disruptive Technology for Log Search and Analytics”. I was tasked with creating a “connector” for it (Adding a Custom API, and Integrating it with PowerApps and Flow). This originally detailed writing a Swagger for it and grabbing an icon off of a Power Point. The objective of adding this API is deceivingly simple: we just wanted to allow users to be able to include a Query to the backend in one of their flows. That is, a flow should just be able to query given a cluster name, database name, and query string and receive tabular results. The Swagger contained all the necessary information including the security definitions (AAD in this case), a single well-defined “POST” call, and explicit definitions for the request object to the backend as well as the response object (JSON Objects in this case). The main problem is the response from the query. The response object is a “table” derived from a specific query; It’s impossible to know the number and names of the columns that will be in the table, or the type of information each column is represented by until the query is actually executed. This means the Table is dynamic in nature. My first implementation although functional was completely useless to an end-user unless they have clairvoyance and l33t webdev skills. It was to inconvenient to use, which defeats the objective of Flow when we want people to “Work less, do more”. Luckily, the team had encountered this issue while integrating services like SQL Server, Excel, Sharepoint. The team developed a Swagger Extension: “x-ms-dynamic-schema”. This extension allows a definition in the Swagger to have the property “x-ms-dynamic-schema” which also entails referencing a function that will dynamically populate the schema. Now while editing a Flow if this custom API is used, the Flow Designer should recognize that there is dynamic schema definition and call the function attached to the definition. This allows Flow to get the schema during editing a flow instead of running a flow and allows the reference boxes to be populated in later condition or action cards. This is a nice solution to the problem of dynamic schema, but I encountered interesting obstacles on this endeavor of implementing x-ms-dynamic-schema into the Swagger… The first problem was the fact that there is currently a small bug where the Flow Designer will only recognize a dynamic schema call if the referenced function is a GET method (this actively being fixed). Too bad the HttpRequest needs to have a JSON body that includes the database name and query string, because the internet gets angry you if a GET request has a body. It’s pretty much impossible for the Flow Designer to navigate and understand the schema of this object by itself, and I can’t internally extend or modify the Web API. I now have a request problem and a response problem. I explained this depressing realization to a teammate. 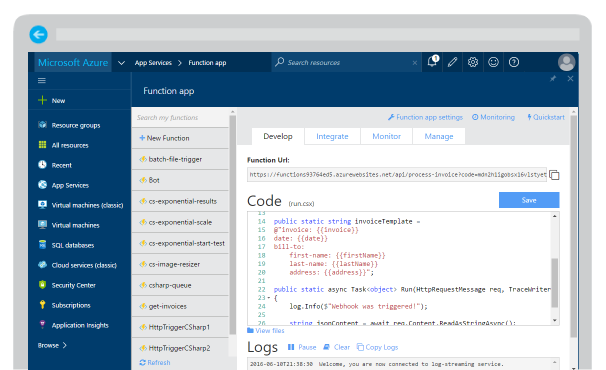 Azure Functions are this cool new app service on Azure that basically allows you to easily setup serverless code that can get triggered by different things. It’s quite magical. In this case, I was going to leverage an Azure function to act as a mediator between Flow and the backend. With this I am able to modularly address each problem. 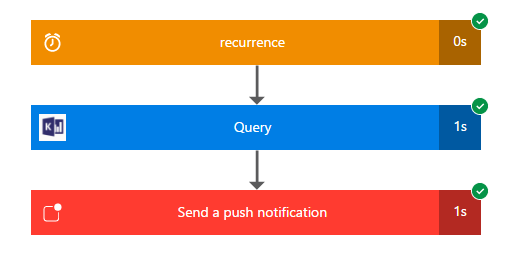 This means I can send whatever I want from Flow to the Azure function and then in the Azure function modify whatever I need to and build a new request to Application analytics with the correct parameters. This circumvents the GET problem as I ended up breaking up the JSON object properties in to strings and stashing them in the Http Request Query then, in the Azure Function, rebuilding the JSON object in the body of a new Request to the backend. 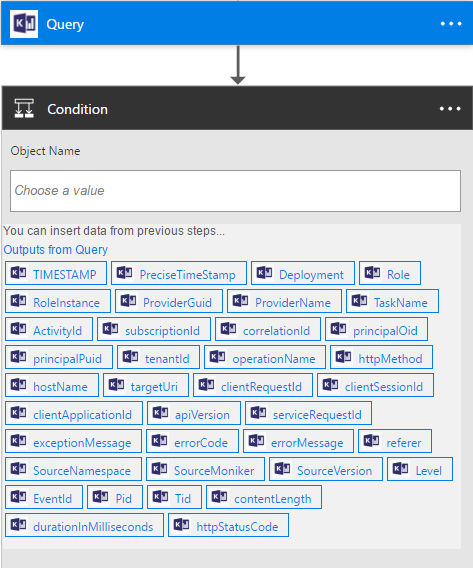 Now, Flow is able to talk to the Azure Function and the function talks to the backend. There is still the response object problem from before. The response object the backend sends back to the Azure Function then to Flow is still exactly the same and as useless as ever. To solve this, the JSON.net C# framework was particularly helpful. 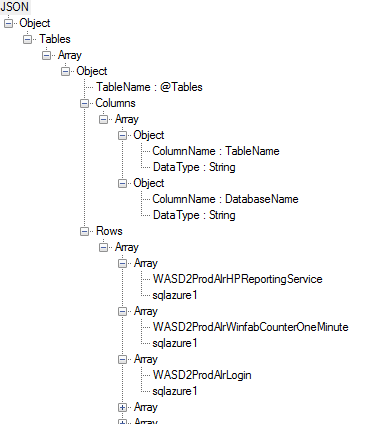 When the Azure function receives the response from Application analytics, I parse the content of the response as a string into a JObject and then manipulate JTokens to simplify the original JSON into something more digestible by Flow. The complexity with this logic came from the fact that Flow needs to be able to get the Schema during editing and the actual Data during run time. With this, two Azure functions were necessary. One to derive a schema of a consolidated, simplified JSON object representing the Table, and one to actually create that consolidated, simplified JSON object. Creating a JSON object that represented the schema of another JSON object using JSON.net was very reminiscent of inception (It didn’t help that there exists a “JSON Schema.net” I could not use as it requires a license the team doesn’t have). Finally, after I finished modifications to the JSON schema and object, Flow was able to understand the JSON and populate those glorious reference boxes! 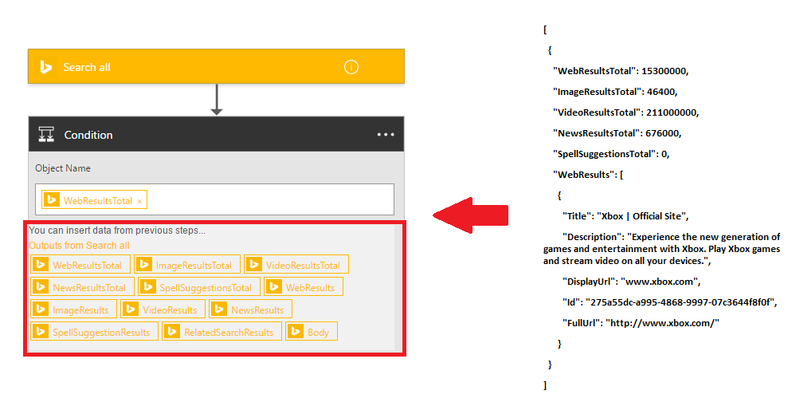 With completion of the JSON modifications, the Application Analytics Custom API now worked perfectly with Microsoft Flow. Having the reference boxes is a world of difference and was worth it for the result of making using Application analytics queries in a Flow extremely easy and powerful! Creating the implementation for the Application analytics Web API helped form a great foundation using Azure Functions for extending and controlling a service without directly modifying it. The experience provided a great discovery and learning opportunity and resulted in a well-received addition to Flow. Finally, click the + New Custom API button in the top right. Hit Next, then another box will pop up if you specified Authentication in your Swagger. Fill out the required information and then hit save. Now your Custom API has been uploaded and you’ll be able to search for it when creating or editing a Flow and use it!